The Boston University’s men’s and women’s cross country teams both had a strong ending to their seasons, as the men’s and women’s groups finished 12th and 13th overall, respectively, at the NCAA Northeast Regionals Friday morning at Van Cortlandt Park in Bronx, New York. For the women’s team, the Terriers were led by senior Rosa Moriello, who finished 13th in the 6-kilometer race with a time of 20:35.81. She improved from last year, where she finished 25th overall. Moriello also qualified for the NCAA Division I Cross Country Championship Saturday in Terre Haute, Indiana. 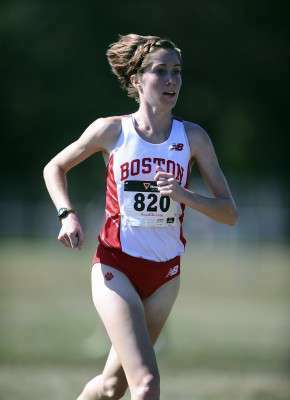 She is the first Terrier to qualify for the NCAA Championship since 2008. Other strong runners for the Terriers were junior Michelle Sumner (21:42.00) finishing in 65th, junior Shelby Stableford (21:49.71) in 79th and sophomore Sarah Saccoach (22:17.08) in 114th. The Terriers’ 389 points were a better score than any other Patriot League team in the race. The race was won by Iona College, who totaled 91 points. They were followed by Providence College with 128 points and Dartmouth College with 136. Lehane said he was very pleased with how his team’s season ended. As for the men’s team, the Terriers finished 12th out of 39 teams, and second among four Patriot League schools competing in the meet. Junior Kevin Thomas led the Terriers in the 10-kilometer race with a time of 31:14.83, earning himself a 32nd place finish. Behind Thomas for the Terriers was junior Alec Olson (31:31.72) in 53rd, sophomore Mitch Russo (31:41.35) in 70th and senior Ben Ravetz (32:01.41) in 90th. Syracuse University won the meet for the men’s race, edging out Providence by three points, 45-48. Now that the season for both teams has come to an end, Lehane stressed how influential the seniors were for each team’s success this year.